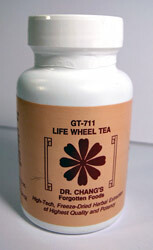 Chinese Herbal Formula AIDS, immune system, glandular function, Impotence, low sexual drive Life Wheel Combination from Dr. Chang Forgotten Foods contains Zeltinum seed, Cuscuta seed, Lycium seed, Plantago seed, Elettaria seed, Scaizendra seed. Ingredients: Zeltinum seed, Cuscuta seed, Lycium seed, Plantago seed, Elettaria seed, Scaizendra seed. Overall "tune up" of glandular function. Impotence and low sexual drive. Note: In the ancient times this combination was used to strengthen the seven glands considered to be the wheels of the life of a human being. These glands are the sexual, adrenal, pancreas, thymus, thyroid, pituitary and pineal.